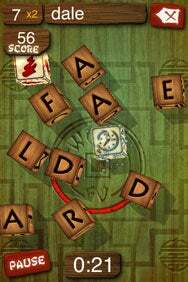 WordFu, a $3 game from ngmoco, isn’t your mother-in-law’s jumble game. It’s a manic-paced, cleverly-crafted iPhone app that takes only a minute to play. The game is both fun and funny, and well worth a download. Word Play: You’ve got 45 seconds to make as many words as possible out of the nine letter dice in Word Fu. WordFu takes five or six seconds to load, but once it’s open, everything about it is fun. The theme music has a great Far Eastern sound, with lots of manly Fu-inspired chanting and grunting in the background to set the mood. The sound effects are similarly amusing, full of Kung Fu-esque cries. I found myself looking for a button on the bottom of the screen to submit words—the shake submission didn’t feel right to me, and my brain kept forgetting to tap near the top to submit instead. But that’s really pretty picky. WordFu plays fast, and it’s a blast. WordFu is compatible with any iPhone or iPod touch running the iPhone 2.2 software update.